Justice League: Throne of Atlantis is a 2015 straight-to-video animated superhero film from Warner Bros. Animation. It is the 21st film in Warner's line of DC Universe original animated movies. The film features DC Comics' top superhero team, the Justice League, with a focus on Aquaman. Justice League: Throne of Atlantis is loosely based on the 2012-13 comic book story line, “Throne of Atlantis.” Written by Geoff Johns and drawn by artists Ivan Reis and Paul Pelletier, “Throne of Atlantis” was published in Justice League (2011) #15-17 and Aquaman (2011) #14-16. 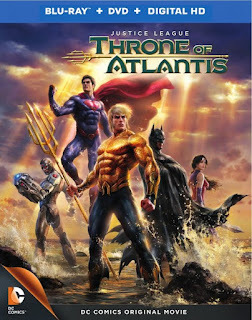 Throne of Atlantis the animated film pits Aquaman against his half-brother for the throne of Atlantis, as the Justice League tries to stop a war between the humans on the surface and the people of underwater kingdom of Atlantis. Justice League: Throne of Atlantis opens with a mysterious attack against the S.S. California, a United States Navy submarine, in the Marianas Trench. The attack is the first salvo in a war that Orm (Sam Witwer), a prince of the underwater kingdom of Atlantis, wishes to declare on the surface world. His mother, Queen Atlanna (Sirena Irwin), seeks peace with the humans on the surface. Atlanna sees her half-human/half-Atlantean son, Arthur Curry (Matt Lanter), as the key to this peace, and she sends a trusted warrior, Mera (Sumalee Montano), to protect Arthur and to inform him of his royal heritage. Justice League: Throne of Atlantis is neither an exceptional “DC Universe” animated movie, nor is it a particularly special Justice League animated film. Personally, there wasn't enough Batman in it to suit me, although, to be honest, most of the DC Comics animated films either star Batman or feature him in a prominent role. Throne of Atlantis is entertaining, and I wouldn't have minded if the film lasted longer; of its 72 minutes of run time, barely 65 minutes features actual story and action. This film's version of Atlantis is intriguing, but the movie doesn't reveal much about this underwater kingdom other than that its citizens are ready to kill surface dwellers with little provocation. I must say that the creatures, armor, and machines of war for Atlantis are strikingly designed. A longer film could have shown us more sides of Atlantis and not just the martial side. Of note, Nathan Fillion delivers an uninspired voice performance as Green Lantern, but Shemar Moore shines as Cyborg. I have to be honest with you, dear reader, I am always up for watching a DC Universe animated film, so Justice League: Throne of Atlantis pleased me and did leaving me wanting more, simply because it is fun to watch. VIZ Media Offers a Taste of "Komomo Confiserie"
Dylan Horrocks Tours for "Sam Zabel"
VIZ Media's Opens "My Hero Academia"
Review: "Fear of a Black Hat" Has Fun with N.W.H.